Players have an important role within the club; they are the face of the club on the field of play. But more than this, players have the opportunity to represent the club’s values to the broader soccer community. Whether it is on the practice field or in a game, the player’s are an indication of what is right about your club. That is why Team Colors supports the Xara created Player of the Month Program, It encourages all players to strive not only to improve their core soccer skills but also to live up to the values of your club. The coach can reward players not only for their effort on the field but also for their commitment to the club’s core values. They are part of what makes each club unique. 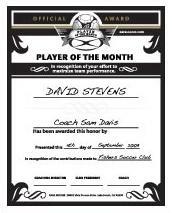 This program acknowledges that there is more to a being a Player of the Month than scoring goals or making great plays. Each club has the opportunity to create their own criteria for the award, this gives them the opportunity to set a standard that let’s players, coaches, parents and administrators know what is important to the club. To learn more about how your teams can create a player recognition program to build team and club ties click on Xara web site link or contact Team Colors for a meeting at sales@teamcolorswa.com or 253-606-3656.